The 4TITUDE™ is DonJoy's lowest-profile brace. Available in DonJoy's same 7 sizes, you also get your choice of 3 lengths, so it's perfect for those who are short or tall, and will easily fit women or men. So if you have mild to severe knee instabilities and are looking for solid support for the activities of daily living or non-contact sports, go for 4TITUDE™ and Never Stop Getting Better. Shop our complete selection of knee braces, browse additional DonJoy products or 4titude replacement parts. What is the length of the standard size vs. the shorter size of this brace? I have complete tears of the ACL,MCL and the LCL along with miniscus mostly gone. Which brace would be best for daily use? I need knee replacement surgery but not ready for it yet. Any of our rigid knee braces can be worn for everyday activities. The 4Titude is a particularly great brace to protect all of the ligaments that you have mentioned. I have had this brace for less than a year and quit using it because it keeps sliding down my leg. I have tried to get it as tight as I can without causing pain. Nothing seems to help. Can you suggest what I can do? Also where can I get the Pads that go outside the knee? Hello. I have a question. What's the difference between DonJoy Fullforce and DonJoy 4titude? I have my ACL reconstructed. Also have problems with a miniscus. Which one of those two braces will suit me best? and why? I have a right medial meniscus horizontal tear. 1)Which brace is best, 2) is there a lifetime warranty on any? 3) can I go to a local phyical therapist or chiropractor for measurements (I live in Pendleton Oregon, USA). Our patient ready braces have a one year warranty on the hinge and frame. Is the 4Titude with CI starpping also water proof? I have a PCL injury (torn meniscus). I have found a distributor in Switzerland, where I live, who only has 4titude withe CI strapping. Would that work for me? Also, you should start thinking of shipping to international locations. The DonJoy 4Titude with CI strapping would work perfectly for you. I have seen many Donjoy braces in different colors and am wondering of this is an option for the 4Titude. I am required to wear braces for both knees do to a genetic malformation that causes my joints to be weak and would like to have a different color for each one to make it easier to tell them apart. Thank you for your question. The CI strapping would be indicated for both ACL/PCL injuries. If you have ACL/MCL injury you would go with the ACL strapping. The uprights on the rigid braces support the MCL and LCL. Strapping sequence is in reference to the ACL/PCL. The FourcePoint hinge would be contraindicated for a PCL injury there for is not recommended for CI strapping. For your situation you could get the ACL strapping with the FourcePoint hinge. If you have any additional questions please don't hesitate to call. We have a disrtibutor here in the Philippines of 4titude and playmaker. Is 4titude ok for Acl tear without operation. I have an acl tear in my left knee and Im looking for something to add more stability when I'm playing basketball. My left injured knee is still strong and I can jump with that knee but wanted more stability when landing with it. The seller says the 4titude can be for acl, pcl and ci. how would I know if its for acl to make sure I get the right brace? Can you be more specific on the strapping sequence for an acl pcl and ci? I was diagnosed with partial acl tear through mri. That was some years ago. In case I also tear my pcl or have CI, can I still configure an acl fortitude to pcl or ci? The seller says it can be used on those kind of injuries and they are selling only one kind of 4titude that can be used on those injuries. An email has been sent to you showing pictures of the strapping sequence for the ACL, PCL, CI. You will order your brace based on your specific needs. It sound like ACL strapping would be the option for you. ACL is designed for a person with an ACL injury, PCL would be for someone with a PCL injury and the CI is combined instability (PCL & ACL). Each sequence is specifically designed to stabilize the knee with the injury in mind, therefore PCL strapping would be a contraindication for an ACL injury. If you have receive a brace with ACL strapping and later would like to add the CI, your brace must be shipped back to have the additional straps, and holes for the double D ring to be added. One last recommendation if you go with the 4titude there is an option for a FourcePoint hinge. This hinge will offer additional support to your ACL. This hinge is ONLY available with the ACL option, as it is a contraindication to PCL injuries. Hope This information helps you out. Thank you for contacting DJO. You have a 6month warranty on your brace frame, if it has bent please call us at Customer Care, 1-800-336-6569. My thigh is 23.5 inches, knee center 16.5 inches, and calf is 18 inch. Do you have any suggestion about the size I may choose? L or XL? Should I concern the suitability of knee center? The thigh bar and calf bar are malleable, you can bend the frame to open it up if it's too tight or you can bend the frame in if it's too loose. I recommend taking your measurement 1 more time and than deciding between the Large of XL. The MCL is a ligament on the medial side of the knee. Because this is a rigid hinged knee brace the answer is yes. The reason this is not a strapping option is because the brace strap for ACL, PCL or combined instability issues. Strapping would not affect the MCL as the rigid brace will keep it from being stretched no matter what strapping option you use. If I have a brace, how do I tell whether it is for the ACL, PCL, or CI? Is there a brace that you can recommend that will fit with my ski boot which comes up high on my calf as I am only 5''4"? When you order a DonJoy 4Titude, you chose what type of strapping sequence you need (ACL, PCL, CI) - it does not come automatically strapped. You choose according to whatever injury or ligament you need to support. You are able to order this brace in a short thigh and short calf model, which will accommodate to the length of a ski boot. will this brace be protect me against patella dislocation?If I have dislocated my kneecap once . 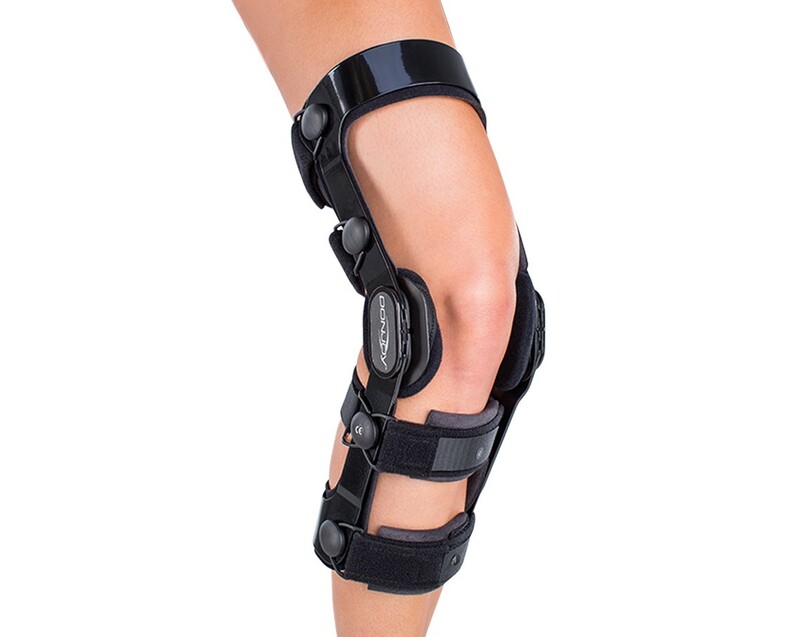 No, this brace is not intended specifically for patella dislocation - it is for ligament support (ie - ACL). If you are using the brace for ligament support and would like to add patella dislocation support, you can order an accessory called the Tru-Pull Advance Attachment that does support patellar dislocation. If you are looking for a brace specifically to prevent patellar dislocation, we recommend the Tru-Pull Advanced System, the Tru-Pull Lite, or the Lateral J.